That's how Kocabaş, an artist and teacher in Istanbul, described the art of paper marbling to me. Known in Turkish as ebru, the process has been inscribed on UNESCO’s List of the Intangible Cultural Heritage of Humanity -- a list that Morning Calm, the inflight magazine for Korean Air, is featuring in a series of cover stories. 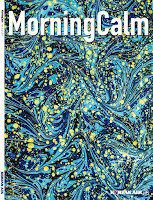 I was asked to write the magazine's feature on ebru, which appeared on the cover of Morning Calm's July 2017 edition, and delved into controversies about the art's origins and the way both tradition and innovation are playing a role in keeping it alive. You read my piece, "Water Colors," accompanied by lovely photos by John Wreford, in the online version of Morning Calm (requires a Flash-enabled browser).